Committed to stimulate church planting, Kelly and I held meetings with district superintendent, Magaly Balam, soon after our arrival. She received us enthusiastically and recommended further meetings with a committee charged with the very task that we were promoting. Nevertheless, our arrival appeared to have been a bit late in coming. As event planning for the district had already taken place, those meetings had been suspended. Until they could resume, we could and did state our intentions informally, but no action could be taken. In the meantime, the fall progressed with the various mentions from our leadership in the States of evangelistic resources available for those who had a need. We knew that we could utilize them, but without direction from the district, we felt that we needed to allow others with more pressing needs to speak first. Fast forward to this December when we had our first meetings with the department of Evangelism. 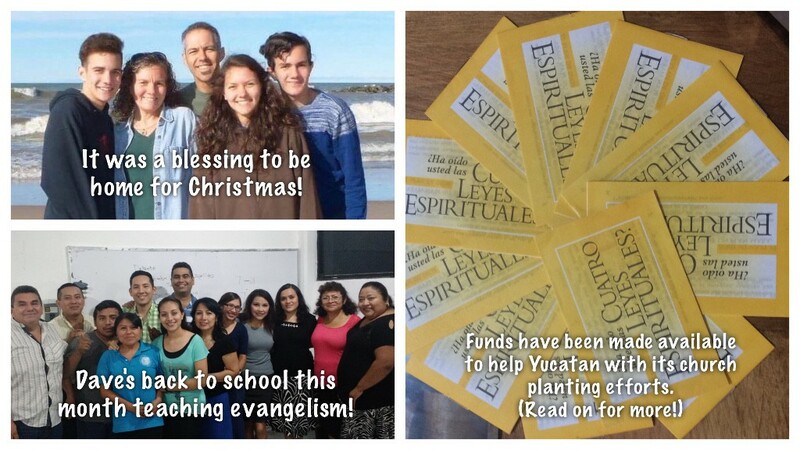 They shared with me their ambitious project to plant 26 churches, and they stated their needs; among them was evangelistic literature totaling 200,000 tracts and some 1,500 Bibles. I left that meeting pledging to do all that I could to help, but at the same time wishing that they had talked to me sooner, when funds were available. Hope the fireworks did not keep you awake. Mexico City was silent. Not sure why. Anyway, just a reminder, the field still has LFTL and BGMC funds available. While Mexico City was silent, the explosion of gratitude that overtook me was stronger than any blast the A-Team could have concocted. LFTL, or Light for the Lost, is a ministry dedicated to providing literature for outreach purposes. That was the exact resource that our district needed to be able to fast track its upcoming efforts, the same resources that I thought had already been distributed. Needless to say, I replied immediately, and funds meeting nearly the entire need will be made available with plenty of time to order and receive delivery of the tracts and Bibles before the evangelistic push which is set to begin mid February! While I admit that my life as a missionary might not always be exciting enough to fill a slot during prime time, as I sent out my thank you note to those who helped, I found myself repeating the phrase, “I love it when a plan comes together.” Don’t you?